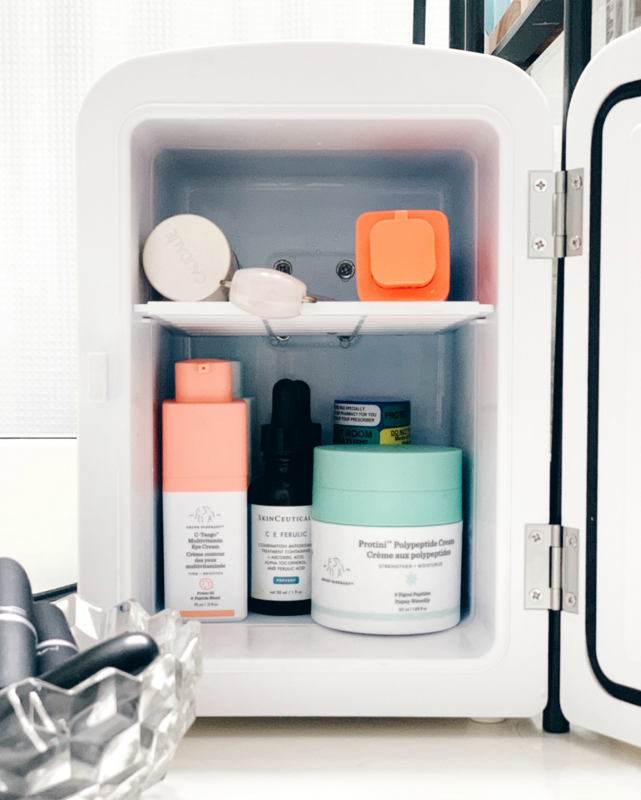 Do You Need A Skincare Fridge? Vitamin C has an extremely short shelf life because it breaks down when exposed to oxygen and bright light, as well as warm temperatures. Storing your Vitamin C products like the Drunk Elephant C Firma Day serum, or the C E Ferulic serum, will help delay oxidation. 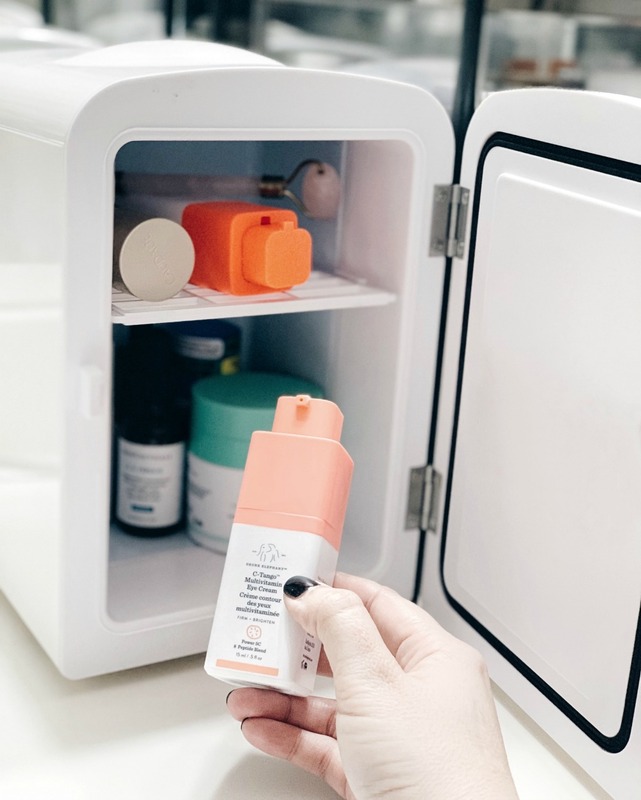 Other unstable ingredients like retinols are similarly sensitive, so wise to pop those in too. While most people don’t need to refrigerate their moisturizer, those with dry or itchy skin may see extra benefits. Keeping your moisturizer cool can soothe and calm irritated skin. Also, if you have any moisturizers with hydroquinone (like I do), it’s best to keep cool. Cooled eye creams will feel amazing, bonus… cooling helps vasoconstrict the area, meaning it will help depuff and diminish undereye bags. Masks, especially sheet masks, feel fantastic cool. Same goes for mists. They just feel amazing on your skin. Facial rollers should be kept cool. These beauty tools help push products deeper into your skin (I usually use them after serum), and as a plus, they also feel so wonderful and soothing on your skin. Use the small side of the roller in the undereye area to depuff. 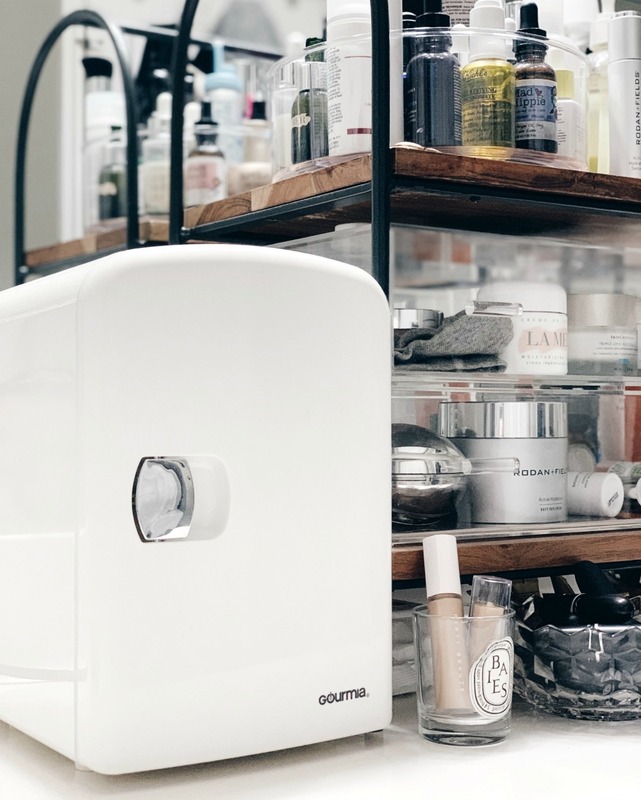 There are lots of portable mini fridges you can add to your bathroom counter. I have a simple, white Gourmia, and it works just fine. It’s not completely silent, there’s a little bit of white noise, but it doesn’t bother us at all. It has two shelves and works great for what I have in there. A lot of people use the Cooluli since it has a space on the door ideal for keeping sheet masks. There are some retro styles too that look really cool.